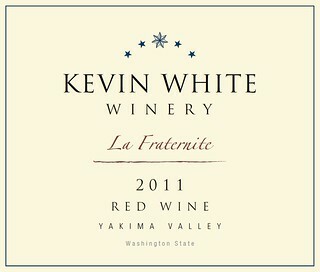 paul gregutt's washington wine blog – unfined & unfiltered: kevin white – doin' it right! kevin white – doin' it right! There’s a sea change in the way new, tiny, boutique wineries are being prepped and presented, at least among some of the more compelling examples that have appeared here in the Pacific Northwest in the recent past. Credit better education, mentoring, global experience, youthful energy, a bit of history to draw upon, the challenging economy, changing tastes and lifestyles – any or all of the above come into play. But in more than a few instances, I’m seeing wineries debut with limited releases of well-crafted, well-designed, affordable wines that showcase fruit and vintage and variety, while eschewing high alcohol, heavy-handed oak, and over-ripe, jammy excess. The poster child for this renaissance may well be the Kevin White Winery, whose second vintage, released a few weeks ago, is already causing a big buzz around Seattle. White is a 30-something Microsoft engineer, an east coast transplant, whose interest in wine went from zero to pedal-to-the-medal in just the past decade. White was a self-proclaimed PBR drinker when he arrived in Washington in 2000, but over time he began visiting wineries in the Woodinville area and came to conclude that “wine is pretty good.” He then began visiting wine shops, determined to pursue his palate education. His “aha!” wine moment came when he purchased two bottles of Côte Bonneville’s Carriage House Red, one for a gift, one for himself. He set up a visit to DuBrul and was very impressed with the vineyard and the owners. He explains that he’d been looking for something to do that was not completely computer driven. “I wanted a human-to-human connection, a community.” That visit got him thinking that the wine community was a good place to put his energies. “It all started jelling,” he recalled in an interview last week in Waitsburg. The often-praised generosity of Washington winemakers came into play. First Hugh Shiels at Côte Bonneville, then Jon Meuret at Maison Bleue, Chris Sparkman and the folks at Baer offered advice and encouragement and, at Baer, a winemaking facility. But the rest was all Kevin White. He impresses immediately with his focus, energy, intelligence and work ethic. “I wanted to get into the wine business with my eyes open, and enough knowledge to be successful on a small scale” he says. Beginning in 2010, he made just four barrels of Olsen vineyards Block 14 Syrah. A spectacularly good choice for a neophyte winemaker. White says he downplayed it, telling his friends that this first Olsen Syrah was “my science experiment.” By all accounts (I have not tasted the wine) it came out well. “I dedicated myself to those four barrels as if they were 5000 cases,” White explains. In 2011 he got the same Olsen Syrah, along with Olsen Mourvèdre and Upland Grenache. 350 cases were made of the two wines just being released this spring. Still in the works are the 2012’s, which now include Syrah from Wallula; and the plan for 2013 is to add DuBrul Cabernet and Merlot for a Bordeaux blend. Here are my notes on the 2011 reds. Full notes and scores will be published in a future issue of Wine Enthusiast magazine. White’s website carries a comprehensive list of retail and restaurant outlets for both wines. A blend of Grenache, Mourvèdre and Syrah, this is right up there with the best of Maison Bleue for a southern Rhône blend from Washington. Lovely aromatics introduce a forward, fruit-powered wine loaded with scents and flavors of ripe cherries and plums. The red fruits are enhanced with hints of tobacco and mineral, but the lollipop fruit core is what captivates through a long finish. Olsen vineyard Syrah and Upland vineyards Grenache combine in equal proportions, making a compelling blend that nicely counterpoints the winery’s La Fraternité red. Here it’s all about blue fruits, especially plums, along with some earthy, farm-like flavors. The structure and aromatics are outstanding, and the acidity of the vintage suggests that this wine is the one to cellar, while the other wine is the one to gulp. Thanks Paul for the nice words. I'd also like to make a special mention of Leroy Radford (Flying Dreams Winery in Woodinville). Leroy has, and continues to be, a great mentor and friend. In addition those mentioned above, he has been of those mentors who have made this journey possible.